I’ve always adored Tibi’s feminine frocks, but this season the designer has hit it outta the park! Every time I get on Shopbop lately I find myself swooning over yet another dress from Tibi. The color palette is full of all my spring favorites – mints, pinks, lavenders, and creamy whites. And how about the prints? I adore the maxi and mini version of the Arizona print dress! With a serious wedding season ahead of me (I’ve already got four on my calendar in the next few months. What about you? ), I’ve got to start thinking about dress options. Any of these would fit the bill perfectly, don’t you think? I’ve got my eye on this mint shift dress, and maybe this classic black mini. It’s hard to pick favorites! They all just scream spring! I'm loving the first pink dress!Such an amazing collection! Ohhhh I seriously love them all! But that taupe one with the yellow accents is to die for! Going to snoop around Shopbop myself! have been DREAMING of middle top one for beach wedding i am attending this summer!! love! I wore that first dress in black to my engagement party. Absolutely love it! Actually, love all of these!! Loving all these dresses- especially the purple mini! So fabulous. 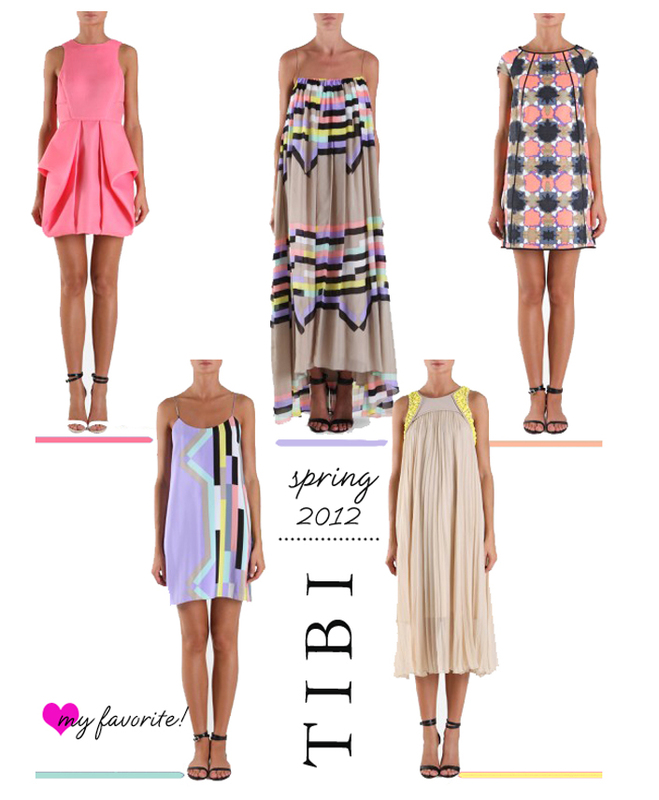 Tibi really can do no wrong in my eyes! My faves are the last one in the top row and the bottom two! LOVE Tibi, they always nail it with the color choices and I hear you on the weddings Bradley, we have 10 this year so far! Ah they seriously DO scream spring! Glorious pieces! That pink dress is so cute! I love this collection! Oh my! I don't even think I can choose a favorite! They are all so amazing!! that tibi maxi dress is on my list! Love the colors! yes please to all of them! Ohh I love each and everyone one of those looks! !